Two of the most common types of small burrowing animals are gophers and moles. More than 30 species of each exist, and the signs they leave on the surface when they tunnel can vary according to species and soil conditions. To tell gopher mounds from molehills, you need to know how they differ. Most gopher and mole species spend nearly all their time underground, so you might not get a chance to see the animals. Gophers have rounded snouts and prominent teeth. Moles have tapered snouts and very small teeth. Moles tend to burrow in cultivated areas because rich soil and irrigation attract the insects and worms that make up their diet. Although gophers eat plant roots, moles don't eat plants. They disturb plants only as a side effect of their burrowing. Gophers like to close the openings of their burrows and will even rush to fix a disturbed door to their tunnels. Gopher mounds mainly differ from molehills in their plugs. The plug is the dirt a gopher uses to close openings to the tunnel system. In the gopher mound, a plug usually shows as a small dip in the mound. It's generally near the center or to the side of the mound. If you stand over the gopher mound and look down at it, its overall shape should resemble a sickle moon or valentine heart. The plug in a molehill doesn't show. Unlike the gopher mound, the gopher's dirt pile stands in a round mass without any dip at its center. 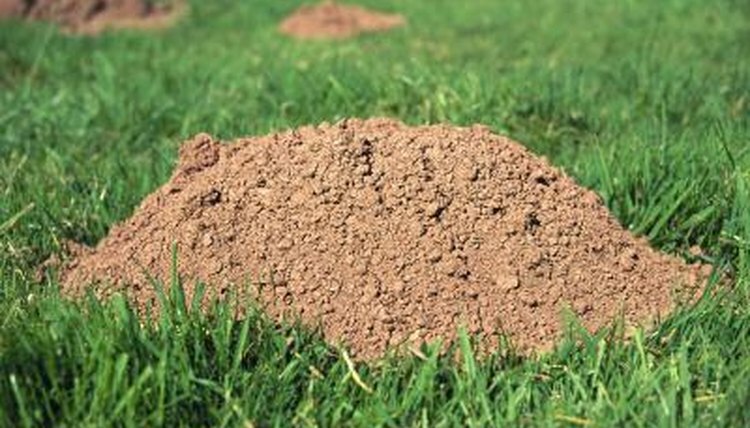 The molehill might be as small as a teacake or up to 2 feet in diameter and 8 inches high. It results from the mole pushing dirt to the surface at the end of a tunnel. Mole tunnels include shallow ones that run so close to the soil surface that they show. Soft earth and mulch raise up in a rounded shape along the length of it. They also build lower tunnels and chambers. Gophers' tunnels don't show unless the soil caves in on them; that's helpful to know if a gopher's plug is indiscernible in a mound because of terrain or rain or other disturbance. Gophers' tunnels may show when snow melts by leaving trails or runnels in the earth, whereas moles' topmost tunnels leave visible disturbance at the soil surface in all weather conditions. Areas of mole burrows will give way when you step on them, because parts of the tunnel systems are close to the surface.